How is a Multi-purpose Pitch Constructed? Multi-purpose pitches allow playing multiple branches of sports. EPDM, acrylic, parquet or astro turf can be used as flooring. 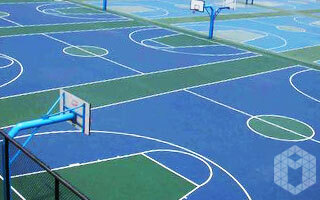 The pitch consists of mini size football pitch, tennis court, and basketball court. The project for the multi-purpose pitch construction is thoroughly prepared based on ground study and stability. Multi-purpose pitches are constructed in 4 main stages. The works start with infrastructure works, then continue with iron and wire mesh works and finally, it is completed with the installation of sports flooring. Multi-purpose pitches can be constructed as indoor or outdoor facilities. Their infrastructures are specifically designed for these two variations. Stirrup concrete is poured according to the anchorage system at outdoor pitches and flange system at the indoor pitches. Iron pipe works are carried out according to the project. PVC coated wire mesh with 5 x 5 cm mesh size can be preferred either for indoor or outdoor pitches. Artificial grass turf with 20-26 mm thickness, 2mm-3mm acrylic floor, or tartan floor can be applied as artificial flooring at multi-purpose pitches. PVC sports flooring made of polyurethane can be applied at indoor pitches. Halide projectors or LED projectors can be used at the lighting systems. What is the Cost of Multi-purpose Astro Pitch? 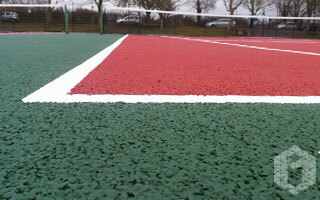 You can also ask for a final quotation for multi-purpose pitch. Our team visits the address and make the survey to ensure the most affordable conditions. The cost and the ideal dimensions for the area shall be also stated to you. A company with international certifications for all these applications can satisfy you. Usually, the multi-purpose pitches in which you can play 3 branches are designed with the dimensions of 18 meters by 36 meters. However, it can be constructed in specific dimensions which may vary based on the area of application. You can also find answers to your questions by looking at sample works completed before. 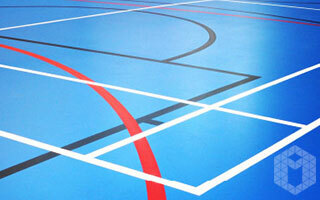 Get the price of multi sports court construction and installation of flooring types.